Woodvale pairs rowboat is the most commonly used ocean rowboat. In 1995, boat designer Phillip Morrison created plans for a boat ideally suited for rowing across Oceans. It is capacious enough to shelter two people and hold several months of provisions, is lightweight, self-righting and shaped to move easily through turbulent waters. The vessel is designed to be made from plywood with epoxy joinery, materials which are lightweight, relatively inexpensive, and easy to work with. Ballast for the rowboat is provided with freshwater tanks and there are two rowing stations. Crew accommodation is provided in an aft cabin six feet in length and about three feet maximum height. The boat is composed of 14 independently sealed compartments which prevents the entire boat from filling if it is holed. 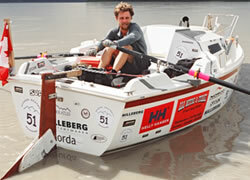 This well-designed boat has become the most common boat used in ocean rowing. Plans and kits can be purchased for the homebuilder, or a growing second-hand market offers a variety of Philip-Morrison-designed boats for sale. For a home-builder, the expense in constructing this vessel is not the basic hull and decks, but the accompanying hardware. Marine equipment is expensive and the cost of hatches, stainless steel fittings, custom-built pulpits, etc adds up quickly. Depending on how much work is contracted out, it can cost $50,000-$100,000 to build a fully equipped ocean rowboat. It is generally cheaper to purchase a second-hand vessel with prices ranging from $20,000 to $50,000. The one-person boat above is a French design made from plywood. These boats are used in the Rames Guyane Race which goes from Senegal, Africa to French Guyana, South America. There is a number of custom-designed boats and variations of the Woodvale Pair in existence. Some are made from composite material which is more expensive, but lighter and more durable. For those planning on rowing solo, there are a variety of one-person boats that have been constructed. These are slightly scaled down versions with only one rowing station. Alternatively a boat designed for two can be rowed solo. Converted sailboat used to row across the Bering Sea. Modifying SailboatsUndoubtedly a boat specifically designed for offshore rowing is the best choice for crossing oceans. It is possible, however, to modify a small sailboat into a rowboat. Many small well-designed sailboats are very seaworthy by being ballasted, properly shaped and sealed. By removing the sailing hardware and adding rowing gear, you can transform the boat into an ocean rower. The primary reason for using a converted sailboat is financial. A fully-capable offshore rower can be created very inexpensively by going this route. The market is flooded with older (but sound) sailboats, which can be purchased for very little. We used such a boat to cross the Bering Sea, and the vessel performed very well. The basic sailboat plus an excellent quality trailer were purchased on Ebay for $2400. Modifications to the boat included lowering the cockpit cowling, replacing the companionway (entrance) with a sealing hatch, fibreglassing all deck hatches permanently shut (to prevent leaking), and reinforcing the front ventilation hatch to prevent leaking. Materials needed for these modifications included plywood, fibreglass, screws, paint, one hatch, and a few other odds and ends. Total cost of the modifications to make the boat seaworthy and ready for rowing was just over $1000. This does not include the rowing hardware or other necessary equipment. Overall cost for the basic rowboat was only $3400. Eighteen foot trailer sailor converted into a rowboat. The vessel is an 18’ Laguna Windrose trailer sailor. Ballast is in the form of a 400 kg cast-iron swing-pivot keel. Interior space is enormous compared to a conventional offshore rowboat. Storage hatches are accessed inside the vessel, and can carry enough supplies to last a year. The pictured rowboat contains three bicycles, five months freeze-dried provisions for thee people, three sets of skiing gear, winter camping gear for Siberia and a whole lot more. In total it is carrying almost two tons of cargo. It is the same length as a mid-sized sea kayak and travels at about the same speed in calm conditions (fully loaded).